With Pluto millions of miles behind us and construction of the James Webb Space Telescope moving swiftly along, astronomers are already thinking about the Next Big Mission. At the top of their wish list? A forty foot-wide orbital telescope that’ll search for proof of life beyond Earth. At the American Astronomical Society meeting this week, representatives from the Association of Universities for Research in Astronomy (AURA) shared their hopes and dreams for next flagship, space-based observatory—the successor to the JWST, which is scheduled to launch in 2018 and run for up to a decade. This future mission, which won’t launch until the 2030s, will seek answers to two profound questions. One: whether or not we’re alone in the universe. Two: how the building blocks of our universe have evolved over cosmic time. It’s a short, sweet, and insanely ambitious agenda. To achieve it, we’ll need a spacecraft more advanced than anything humans have ever built—a telescope with ten times the seeing power of Hubble. As one astronomer put it, we’re talking about Hubble HD. “The road to [discovering] living worlds requires an eight to 12 meter space-based telescope,” said Natalie Batalha, an astronomer who studies exoplanets at NASA’s Ames Research Center. 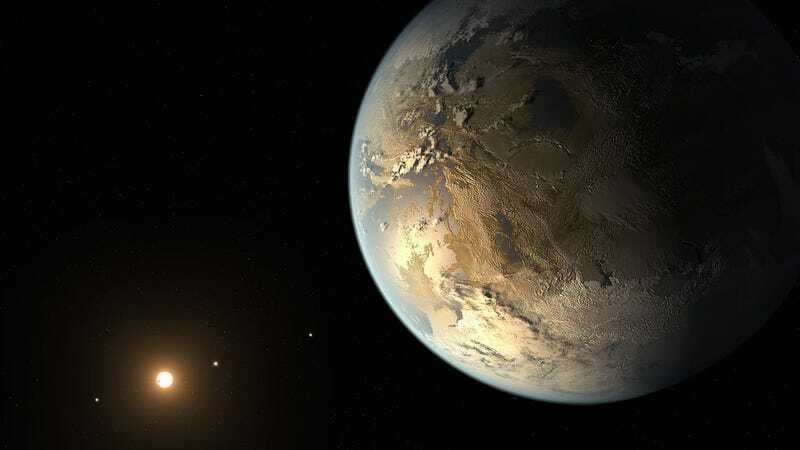 “This is what can consistently survey Sun-like stars within 30 parsecs.” As Batalha explained, 30 parsecs (nearly 100 light years), is the radial distance we need to cover in order to survey several dozen Earth-sized planets in the habitable zone of Sun-like stars. If there’s life out there, and if we can profile a decent number of candidate worlds, we’ll have a reasonable shot at finding it. Putting an eight to 12 meter (26 to 40 foot) telescope into space will be a tremendous undertaking. For comparison, the James Webb Space Telescope—an 8.7 billion dollar, tennis-court sized device that’ll allow astronomers to see the first light from the beginning of the universe—has a 6.5 meter (21 foot) primary mirror. JWST is scrawny compared to the beast of a stargazer astronomers want to build in the 2030s. But scaling up is exactly what we need to do if we’re going to catch the faint light emitted from distant worlds. We’ve already detected thousands of exoplanets using transit photometry, but we’ve only directly imaged a handful. And all of the planets we’ve “seen” are blustery balls of gas, worlds larger than Jupiter that almost certainly aren’t habitable. To glimpse small, rocky planets in the habitable zone of bright, G-type stars (stars like our Sun), and to study their atmospheres for signs of life, we need a telescope with an enormous aperture. A telescope that can suppress starlight by a factor of ten billion. And it has be in space, beyond the obscuring haze of our atmosphere. But JWST’s successor won’t just be searching for life. It’ll also help us learn how the building blocks of matter evolved over cosmic time—in a sense, probing an even more fundamental question about where life comes from. “If we want to go from the Big Bang to bio-signatures, you need to understand the evolution of atoms in the universe,” said John O’Meara of Saint Michael’s College. Accomplishing these two science goals—the evolution of matter and the evolution of life—will take a suite of instruments making measurements across a range of wavelengths, including visible, ultraviolet, and near-infrared. Couple those high-precision instruments with a forty foot primary mirror, secondary mirrors, communications, a starshade and propulsion, and we’re talking one of the most advanced pieces of technology humans have ever imagined. Fortunately, we’ll be able to apply all the knowledge we’ve gathered planning and building other space telescopes over the past fifty years. For instance, a big challenge the JWST engineers faced was how to actually send a 6.5 meter-wide mirror into space. The solution? A bunch of smaller mirrors that unfurl in orbit like gold-plated space origami. There are still many technical challenges to work out—but that’s why we’re starting to think about JWST’s successor now. 2030 may feel like the distant future, but to astronomers, it’s a cosmic blink away. This article originally appeared on Gizmodo on January 7, 2015.